Given that it’s located next to Central Station, the Financial District and many other nearby offices, it’s no wonder that Kudos was packed when we stopped by for a burger. 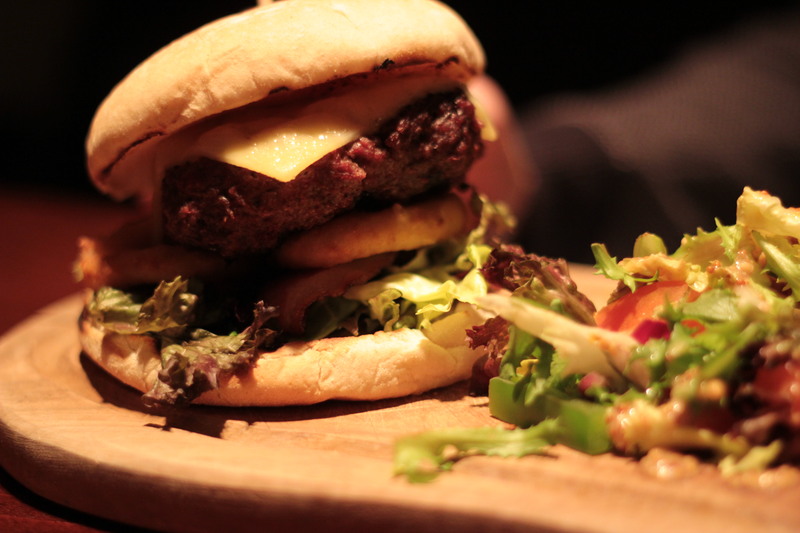 It’s a bar that we’ve walked past many times, yet not heard a whole lot about the food. It was only after reading their menu, which highlights that they are apparantly ‘famous for their Scottish meats, served and cooked to perfection’ that we decided to make it our first burger stop of 2013. 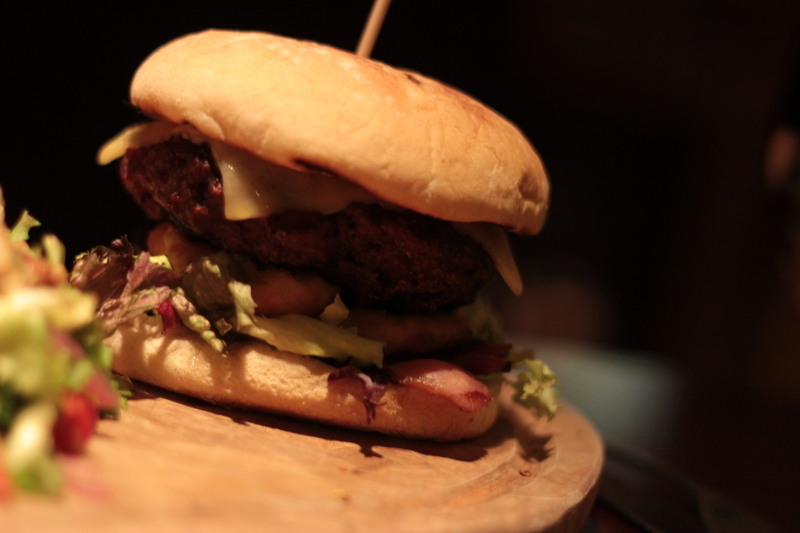 We ordered the ‘Ultimate burger’, described on the menu as ‘covered with smoked bacon slices, onions, prime cheese, tomatoes and lettuce. We also ordered a Chilli Burger, described as a ‘famous beef burger smothered in hot beef chilli with sour cream on the side’. By the time we’d finished reading the menu, I’d lost count of how many times the word ‘famous’ was used to describe various dishes. Surely it had to be good, right? Sadly, it wasn’t. Infact, I’d go as far as to call the burgers two of the worst that I’ve eaten in Glasgow. Not THE worst, but pretty bad. The ‘Ultimate’ burger, which was described as being topped with onions, actually came with onion rings. Not a huge deal, but not what was advertised on the menu. Despite boasting a decent sized patty, the meat was incredibly dry, not very well seasoned and the ‘prime’ cheese didn’t provide much in the way of flavour whatsoever. The bun, which is the same bog-standard, cheap, floured offering that a few establishments in the city centre sadly use, only further added to our disappointment. It was dry, not well toasted and broke apart easily after a couple of bites. 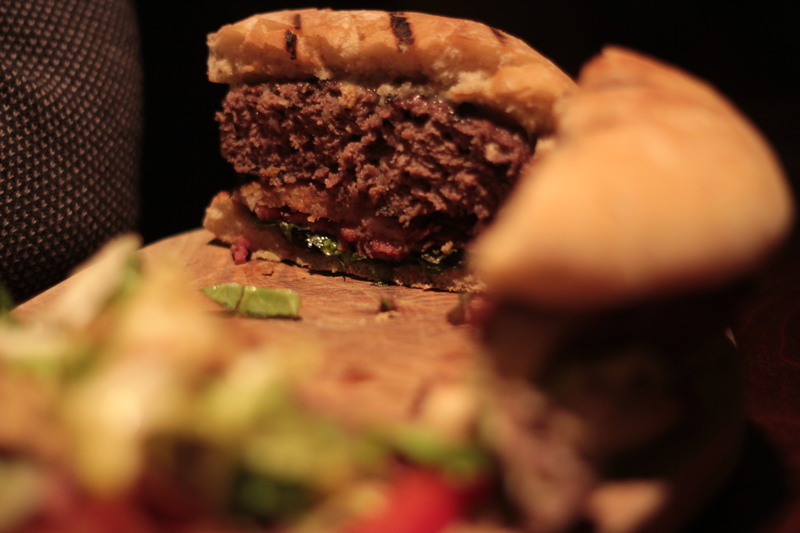 The ‘ultimate’ burger was simply, an ultimate fail. The chilli burger was equally as bad. 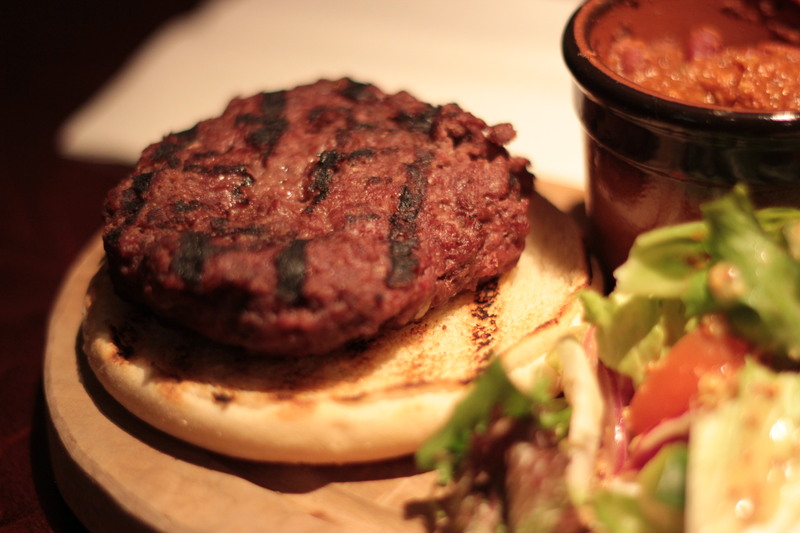 On the menu, the burger is described as being smothered in beef chilli; however, it was actually served with a pot of chilli on the side. Again, not a huge deal; however, the burger isn’t being served as advertised. The sour cream was also missing from our plate, but was quickly brought over once we managed to get the attention of a member of staff. Presentation-wise, this burger also left a lot to be desired. Underneath the floured bun of doom was another dry patty with no salad or any other toppings in sight. It looked very bare and not what you would picture in your head if you were to read the nicely worded menu. 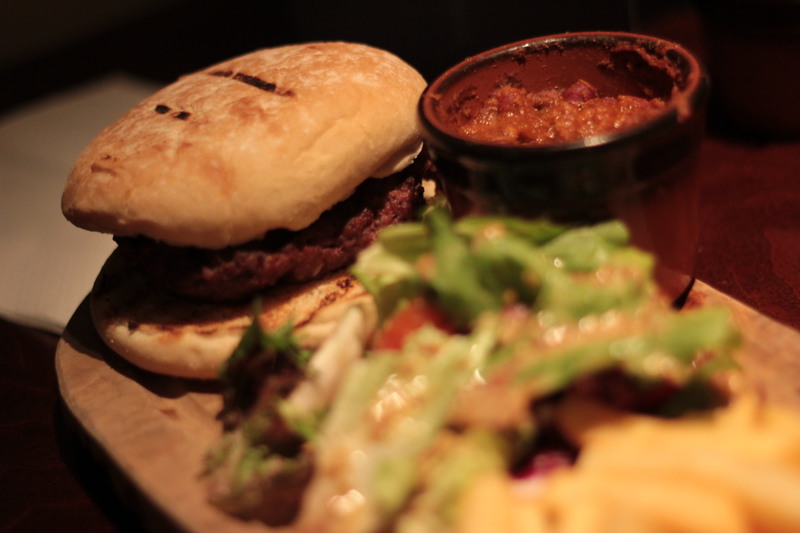 Taste-wise, the chilli burger, much like the ‘Ultimate’ burger, was dry and not very well seasoned. Unlike the ultimate burger; however, it also had a very strange texture and it almost felt like I was eating the inside of a scotch pie. While I do enjoy a good scotch pie, it’s not really what you want from a burger, but to be honest, I think I would have probably enjoyed a pie more than I enjoyed these burgers. The chilli itself was actually pretty decent and even though it wasn’t the best chilli I’ve ever had, it was still the best part of the entire experience. Both burgers were served with fries and salad. The salad dressing provided more flavour than the burgers themselves. Sadly, that isn’t an exaggeration. When our plates were taken away, almost all of the chilli burger remained on the plate and just under half of the ‘ultimate’ burger on the other. When asked ‘was everything okay?’ by the staff, we highlighted the above points and the response we got was ‘sorry about that, I’ll let the chef know’, after which the staff took our plates and walked away. We rarely ever complain about food; however, it seemed like the staff simply weren’t overly bothered that we’d just told them that the food was terrible. At almost £12 pounds for the ‘ultimate’ and £11 for the chilli, the burgers at Kudos don’t offer much in the way of value for money. Given that the place was absolutely packed, we definitely expected a whole lot more. With the side pot of chilli being the one and only thing about our experience that we actually enjoyed, we certainly won’t be returning to Kudos anytime soon. – Burgers not accurately described on menu. If you diss a Greggs pie again this might be the last burger you eat. Haha, I actually love Greggs pies! It’s not what I want from a burger though! source for this information. Hope in Libya will only occur after Qadhafi is eliminated. the virtual one reqires sufficient money. at great players who are match the superstars, yet have a realistic chance of signing for your club. hardware needs. Today, most professionals and companies rely on computers running Windows.